Chiropractors are often called "back doctors." Actually, they have nothing to do with the back itself! 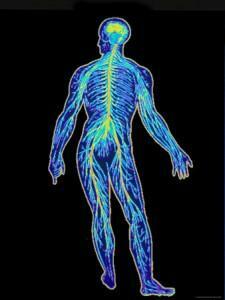 They work on the spinal column -- one of the most important and complex components of the human nervous system. The human body is a remarkable thing. At any given moment, it performs hundreds of thousands of individual functions -- circulating and purifying blood, turning fuel into energy, maintaining proper internal temperature, taking in oxygen, and all the other operations which keep us alive and healthy. Guided by the knowledge our bodies are born with -- our Innate Intelligence -- every cell and organ sends and receives messages to and from the brain. It's clear that the brain and spinal cord are critical to the survival and health of the individual. Protecting them is absolutely vital. That's why the brain is encased in a "shell" of solid bone -- the skull. But what about the spinal cord? How does the body protect it? Obviously, a solid shell wouldn't work. We wouldn't be able to bend, and the individual nerves wouldn't be able to branch out to other parts of the body. The answer is the spinal column. The spinal column is an elaborate "tunnel" of small, interlocking bones slightly curved in the shape of the letter "S." It's flexible enough to allow the body to twist and bend, but sturdy enough to protect the spinal cord. 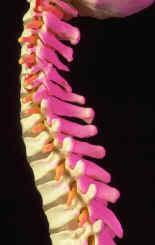 The spinal column is made up of three sections of vertebrae: the cervical, thoracic, and lumbar. When the vertebrae are in their proper positions, the nerves pass through without a problem. Impulses race along the nerve fibers to and from the brain relaying information and instructions without interference. When a vertebra is jarred out of its proper alignment, however, the messages are distorted. The body can no longer function at 100% of its capacity. That's where chiropractic comes in.